We All Know It’s Mad, so What Can We Do to Reverse the Situation? Structural campaigns such as debt cancellation, trade justice, tax justice, climate justice seek to expose and rectify the underlying exploitation and inequalities between the rich world and the global south. Increasingly, post the financial crash, there are more and more connections being made to carry this thinking over to include the majority populations of the rich world. War is one of the chief causes of poverty. War can completely undermine a country’s development prospects, destroying schools and hospitals and putting agricultural land out of use for years to come…. Fully 80% of the world’s 20 poorest countries have suffered a major war in the past 15 years, and the human legacy continues long after. Nine of the 10 countries with the world’s highest child mortality rates have suffered from conflict in recent years. The arms trade undermines development around the world, contributing to the poverty and suffering of millions….The United Nations Development Programme (UNDP) has named military expenditure by developing countries as a major barrier to achieving the Millennium Development Goals. Excessive military spending – and those who promote it and benefit from it – should be much more fully folded into this debate as a way to both rein in excess spending while raising much needed resources to deliver social justice goals in terms of what the world needs and wants. A report in 2012 by Share The World’s Resources entitled ‘Financing the Global Sharing Economy’ detailed the human impact of our collective failure to redistribute income and wealth, both in the developed as well as developing world. Some key points below from the report illustrate the scale of this, as symptoms of structural inequalities that must be dealt with. Around 15 million people die every year largely due to a lack of access to nutritious food, basic healthcare services, or clean water for drinking and sanitation – equivalent to more than 40,000 preventable deaths every single day. 300,000 people lose their lives every year as a result of climate change. Research by the New Economics Foundation suggested that economic growth benefits the richest 1% of the world’s population 120 times more than it benefits the poorest 10%, while levels of inequality in wealth, income and opportunities have rocketed across the world. In terms of assets, the top 1% of the world’s population owns 40% of the world’s wealth. In comparison, 40% of the world’s population – almost three billion people – share a mere 1% of the world’s combined wealth. At the current rate of change, it would take more than 800 years for the ‘bottom billion’ of the world’s population to achieve 10% of global income. In the US, for example, the richest 1% now control more than 40% of the country’s financial wealth, whereas the bottom 80% of the population own only 15% of all privately held wealth. In late 2011 the Occupy Movement vividly captured the extreme inequality that persists across Europe and North America in their slogan ‘We are the 99%’, which has since refocused public debate on this perennial issue. Now, more than ever, there is a growing awareness across global civil society of the scale of this inequality; how the ‘1%’ operate and how the ‘99%’ can respond – there is a growing a solidarity between citizens in rich nations and their fellow citizens in the global south as this understanding becomes more and more discussed. 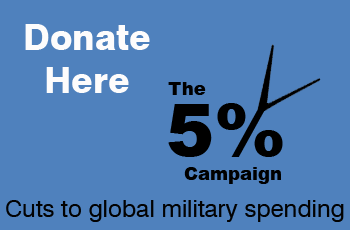 Military spending can be folded into this ‘common cause’ and shared calls for action. Duncan Green in his book ‘From Poverty to Power’ (second edition) writes that it would cost $66 billion annually to get everyone on the planet out of extreme poverty – 4% of global military spending. Bombs and Bullets or Schools and Hospitals? The military spending statistics are now considerably higher. The need to increase support for small to medium scale farmers around the world is as great now, if not greater, yet while millions of small scale farmers struggle to survive, those who are in the business of defence and arms manufacture and sales secure much higher levels of support. Despite the rhetoric of leaders of the industrialized countries, emphasising the importance of education in their government policies and the future of the nations, the reality is that on average the industrialized countries spend 3 times as much on defence as on education; in particular, the ratio is 6:1 rather than 3:1 in USA (Table 2). Many of the world’s poorest countries and fastest growing economies (both measured in terms of GDP per capita) spend much more on defence than either on education or on health; this has detrimental effects on their abilities to bring their people out of poverty, even with considerable economic growth (Table 3). And the continued regional instability in many of these countries almost certainly does not justify their long-term distorted emphasis on defence. Developing countries as a whole spend more than 2 times more on defence than on health. This imbalance of public spending between militarization and developmental areas, such as education and health is happening around the world and is an issue that cannot be ignored. * Data refer to the most recent year available during the period specified in the column heading. x Data refer to years or periods other than those specified in the column heading. Such data are not included in the calculation of regional and global averages. SIPRI estimates that although the recession has affected global military spend, including those nations on the African continent, African countries spent $32.2 billion on their military during the year 2011. Most of the regional increase of 8.6% was accounted for by a 44% ($2.5 billion) increase by Algeria – partly due to concerns over the conflict in Libya. While North Africa’s expenditure was $13.1 billion, sub-Sahara Africa’s was $19.1 billion. Whether on the receiving end of Coalition bombing or drone attacks; caught up in complex conflicts over the extraction of natural and mineral resources; fighting vested interests for land rights; or struggling to avoid the gang-culture of the all-too-often poor inner city community – war, conflict, violence hits the poorest hardest.Fully 80% of the world’s 20 poorest countries have suffered a major war in the past 15 years, and the human legacy continues long after. Nine of the 10 countries with the world’s highest child mortality rates have suffered from conflict in recent years. Armed violence kills around 750,000 people every year. 85% of all killings documented by Amnesty involve guns. 60% of all grave human rights abuses reported by Amnesty involve the use of arms. There are around 639 million small arms and light weapons in the world today. Eight million more are produced every year. By 2020, the number of deaths and injuries from war and violence will overtake the number of deaths caused by killer diseases such as malaria and measles. £4bn is spent on ammunition every year. The number of bullets produced by arms companies every year is estimated at 12bn, nearly enough to kill everyone on the planet twice over. US citizens hold more than 40% of civilian owned guns in the world, that is around 270 million guns in USA alone: about 90 firearms for every 100 people, compared to one firearm or less per 100 citizens in countries like Ghana or South Korea. It is now eighteen months since the recent outbreak of armed conflict in Yemen began, forcing 2.4 million people to flee their homes, and leaving over 22 million people in need of humanitarian support. The conflict has killed over six thousand people, and left the health care system on its knees. The underlying causes of the conflict between the Huthis and the current regime in power are complex, with the latter being supported by a coalition of other states led by Saudi Arabia and supported by the United States. Both sides in this conflict stand accused of serious violations of international law, including war crimes, with particular condemnation of the aerial bombing campaign that is targeted at Huthi-controlled areas. Accusations of war crimes levelled at the Saudi led coalition in particular have included attacks on three Médecins Sans Frontières facilities which resulted in the death of both patients and healthcare workers. As health professionals, we have a duty to speak out against all causes of ill health in Yemen. This must include the sale and export of UK weaponry that is fuelling the conflict. Between April 2015 and March 2016, the UK approved sales of around £3.3 billion worth of combat aircraft and bombs to the Royal Saudi Air Force. A recent legal opinion by Matrix Chambers concluded that the UK Government is in breach of its obligations arising under the Consolidated Criteria on Arms Exports, the EU Common Position on Arms Exports and the Arms Trade Treaty by authorizing transfers of weapons to Saudi Arabia that could be used in Yemen. We join human rights organisations, the European Parliament, the Dutch parliament, Human Rights Watch and Amnesty International in calling for an immediate end to UK arms transfers to all sides in this conflict. We also echo the advice of the Chair of the International Development Committee, Stephen Twigg MP, that the UK Government should retract its opposition to calls for an independent international inquiry into the alleged abuses of international humanitarian law during the conflict. Sipri published research showing expenditure on health and defense sectors as a share of GDP across global regions. Generally, governments spent over two and a half times as much on health as on the military in 2013, though there were some major regional exceptions. Even though the United States spends enormous amounts of money on its military, healthcare expenditure is still far higher across North America. Western & Central Europe also saw health account for 7.8 percent of the region’s GDP, compared to the military’s 1.5 percent. Military spending was higher than public healthcare expenditure in the Middle East, Eastern Europe, North Africa, and Central and South Asia in 2013.